Get inspired with twenty ways to use pesto, because I don't need to hold you back from letting your pesto dreams come true. Pesto is a sauce, typically made with fresh basil, cheese, pine nuts, olive oil + tons of garlic. But it doesn't stop there anymore, you'll find plenty of variations on the classic. Think pesto made with red peppers, tomatoes, jalapeños, cilantro... See? It's endless. So don't wait for it, dive into twenty ideas for using pesto below! If you're down to make your own bread, try adding pesto into the mix. 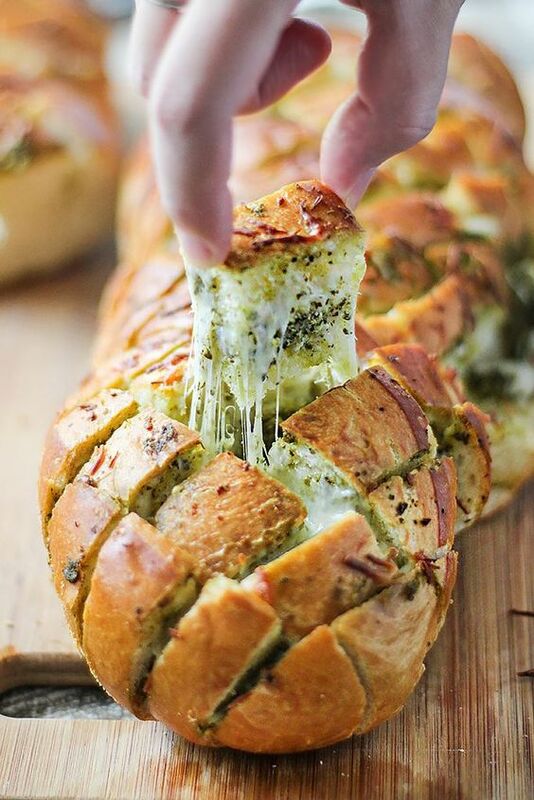 Or make something easier, by slicing up a baguette + adding pesto and cheese. Without sauce, salmon can be fairly bland. Try adding pesto to salmon for more flavor. Definitely add plenty of lemon juice to the pesto to compliment the salmon. Chicken and pesto are another great combination. Try marinating chicken in fresh pesto or toss pesto with zucchini + sautéd chicken for an upgraded take on chicken salad. Ok, this one is really obvious. Pasta! Toss pesto in hot pasta for an easy, delicious meal. Try switching up what pesto you use, like the olive pesto used in this dish. Pesto is meant for pizza! Try it on this version with potatoes, mozzarella, fontina + tons of kale pesto. 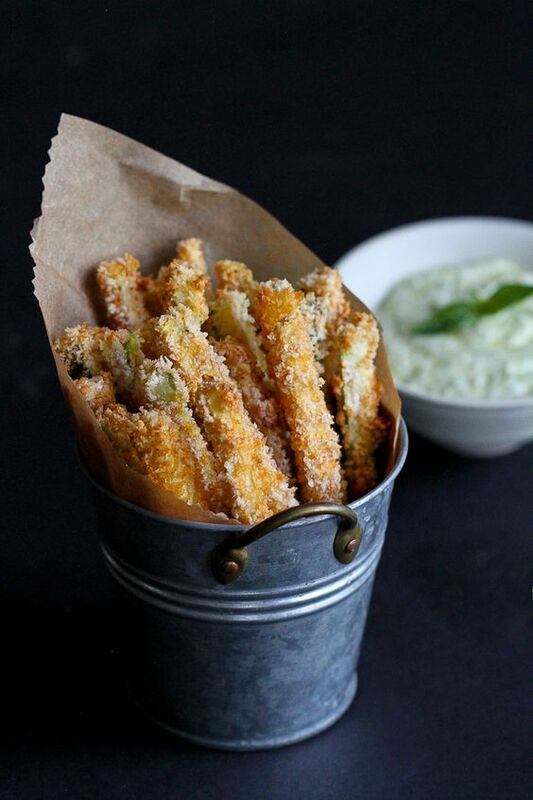 Enjoy pesto mixed with greek yogurt for an easy dipping sauce for french fries or zucchini fries. Switch tamales up by adding pesto. 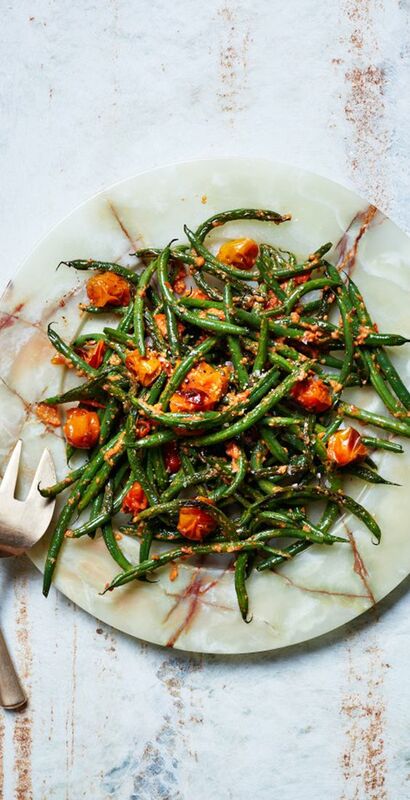 This recipe features a jalapeño one, with cilantro, pine nuts + garlic. If pesto + mayo were people, I'd ship 'em because they work so well together. This recipe combines the two to make an herby, creamy dipping sauce for roasted artichokes. Nope, you don't need to eat bland breadsticks AND yep, you can make your own. 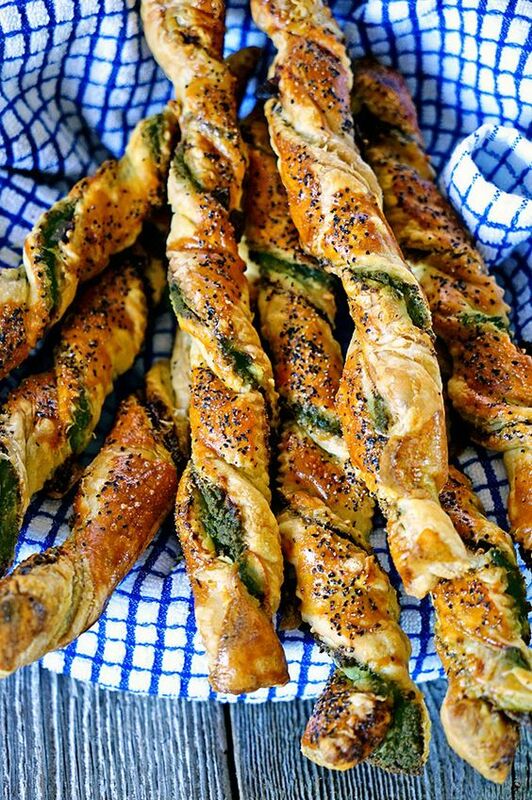 Try layering pesto before twisting pastry breadsticks. It's an easy way to elevate store-bought pastry. First make lots of pesto risotto, so much that you have leftover + make these risotto balls. But you don't always need to fry risotto balls, these are baked! When toast is warm, pesto melts into the nooks and crannies perfectly. You can enjoy toast with only pesto, but try adding other ingredients to complete the dish. 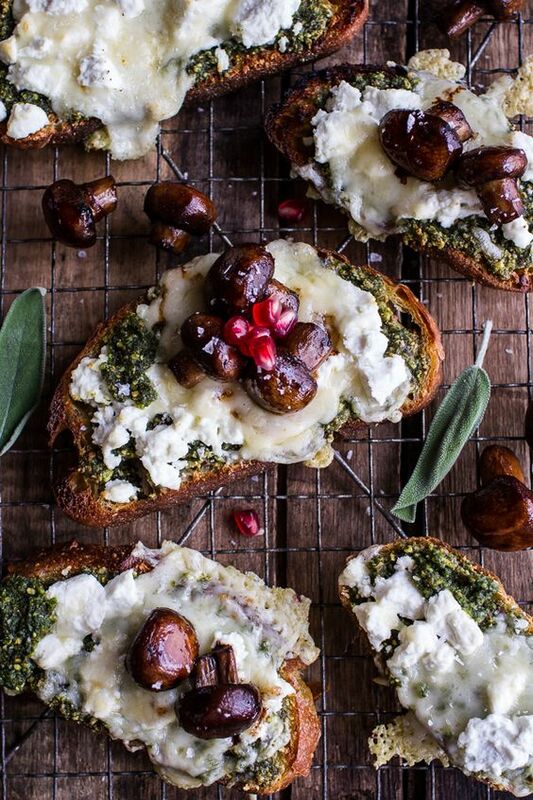 Mushrooms + goat cheese are perfect choices! Pesto doesn't have to be made with basil, tomato pesto is great as well. Think about adding some spice to your pesto + then mixing it with perfectly cooked vegetables. Yes! You can make pesto with avocados + smother it on pasta + call it a day. You're welcome. A simple + trendy combination that gets even better with some pesto. Add pesto to zucchini noodles plus whatever you're serving with them, like salmon, too. Roasted potatoes are the best, but tossing roasted potatoes in pesto can really up the game. Make this for your next BBQ instead of the creamy kind of potato salad. This one's simple, but usually that's a good thing. Use pesto like a salad dressing with shredded kale, then serve with scrambled eggs with goat cheese. Quinoa might be here to stay, and it's good that it goes so darn well with everything. Toss quinoa with pesto for an easy side dish or try it for breakfast with avocado + eggs. It's not always easy to make your own pastry, but when you can make what is essentially the thinest, crisp pizza ever, you do it. Try this one with pesto, tomato + an egg for the heck of it. Cauliflower seems to be the most versatile vegetable ever, transforming into all sorts of dishes including a healthier take on risotto. This one features a pesto that subs in hemp seeds + adds cilantro. Last but not least, the sandwich. Pesto is incredible on a sandwich, but you can be more original than a tomato + mozzarella one. This one is packed with chickpeas tossed in an avocado pesto. So what's your favorite way to enjoy pesto? Let me know in the comments!